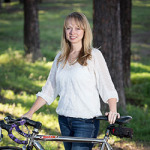 Looking for some adventure, Melissa moved to Arizona in 1995 after completing her Biology degree from the University of Georgia. 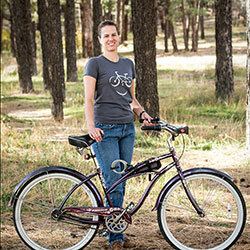 After some time in the Colorado River desert, she yearned for the community and a more active lifestyle and moved to Flagstaff in 2001. She has served on the FBO Board since 2003. She is a recreational mountain and road cyclist and has been active in many cycling advocacy groups, including the Flagstaff Bicycle Advisory Committee. She was also a board member of Summit Velo, FBO’s sister competitive cycling organization and during that time worked alongside another FBO Board member, T.C. Eberly, to promote the road race, Summit Center Classic, in Flagstaff. She is one of three members of the Flag Velo, Inc. executive board. She currently works side by side with Coconino County Safe Kids to promote a Bicycle Education Program and the Helmet Program, which offers helmets to all Flagstaff Elementary students below cost and free to those that cannot afford one. Is an 20+ year bicycle industry veteran with experience in all things cycling from working as a bicycle messenger in New York City and San Francisco to managing 2 different Top 100 U.S. bicycle shops: Poison Spider Bicycles, Moab , UT, (Bicycle Dealer Showcase Top 100) and Absolute Bikes, Flagstaff and Sedona, AZ, (BRAIN Top 100). 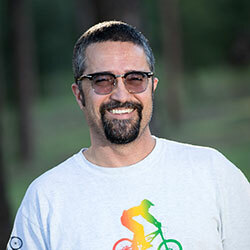 Currently he is the general manager of Absolute Bikes with locations in Flagstaff and Sedona, he is responsible for two high-profile charity cycling events: The Taylor House Benefit Century Ride, and the Flagstaff Family Food Center Old Fashioned Mountain Bike Race and he is a board member with Flag Velo, Inc., and Flagstaff Biking Organization, a highly successful and comprehensive cycling advocacy group. Jolene moved to Flagstaff 10 years ago from Iowa. She was starting to go mad from all the cornfields and found the peaks soothing. She didn’t really do much biking until a fellow co-worker (you know who you are) got her riding for Bike to Work week. After 1-2 years of doing that, she started to ride to work during the warmer months. Now she is a commuter biker riding to work and about town on errands from April/May until October/November. Jolene also loves to bake and decorate cakes. You may have seen some of her works at the County fair. She also volunteers her time with 4-H doing various things. 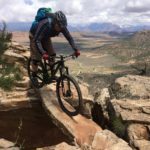 I am a geologist, a Flagstaff resident since 1986, and a mountain biking enthusiast for more than three decades. I’ve biked all over the western US but my focus is a long-term commitment to the trails here in Flagstaff that I love second to none. I’m keeping the two-wheeled adventure going by getting involved in trail advocacy, building and maintaining both new and existing trails, and helping to bring local mountain bikers together to work with other partners towards common objectives as an organized user group. If you see me on the street or out on the trail I’m more than happy to talk about all things bicycle or about rocks and plants.